TO get notifications of cancelled classes, equipment ordering days, and other important events, sign up for remind by texting @AMAAK to 81010. Karate for Beginners classes take place on Monday nights from 6:15 to 7:25 pm in the gym of the Lake Orion CERC Building. These classes are for students ages 6 years and older up to the rank of 8th Gup (Purple Belt). They focus on building self-confidence, self-control and self-defense skills. Students will learn blocks, strikes and kicks for self-defense as well as the traditional history of Moo Duk Kwan Tang Soo Do and the value of confidence, respect and determination. Parents or guardians who would like to train together with their child may also participate in this class. Advanced Karate classes take place on Monday nights from 7:30 to 8:45 pm in the gym of the Lake Orion CERC Building. These classes are for students ranking 7th Gup (Orange Belt) and above as well as teen and adult beginners. Classes focus on flexibility, coordination and balance in addition to expanding on the traditional Tang Soo Do and self-defense foundation that was established in the Beginner Karate classes. Champions Workshop classes take place on Wednesday nights from 6:30 to 7:45 pm in the cafeteria of the Lake Orion CERC Building. The classes focus on the techniques and forms taught during the Monday night classes as well as giving students extra practice on self-defense, sparring and board breaking. Classes run for 10 weeks during the Fall (September-December) and Spring (January-May) sessions. Students wanting to register for the Champions Workshop classes must be registered for the Monday night (Beginner or Advanced) classes. 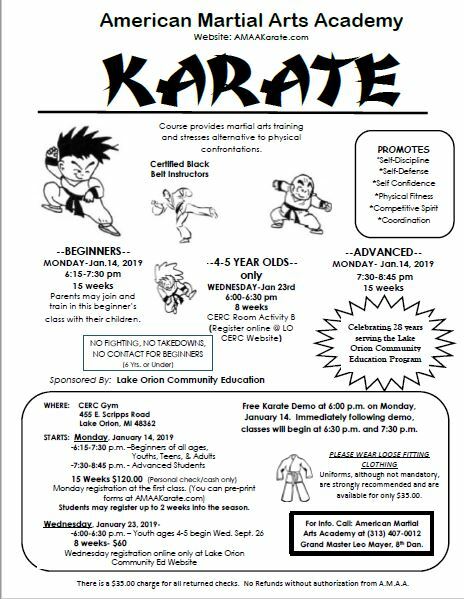 Karate for Kids: Little Ninjas classes take place on Wednesdays from 6:00 to 6:30 pm in the cafeteria of the Lake Orion CERC Building. These classes are specially designed for younger students age 4 and 5 years old. The classes focus on the development of coordination skills, self-control and physical fitness by using exercises, games and group activities. Registration is available through Lake Orion Community Education.